1-3 Phorticium pylonium (Haeckel) Cleve; 1, lateral view, VS-R-71a, 1-3cm, T40/0, 300x; 2, VS-R-60b, 3-5cm, K21/0, 300x; 3, polar view, VS-R-93b, 1-3cm, X22/0, 300x. 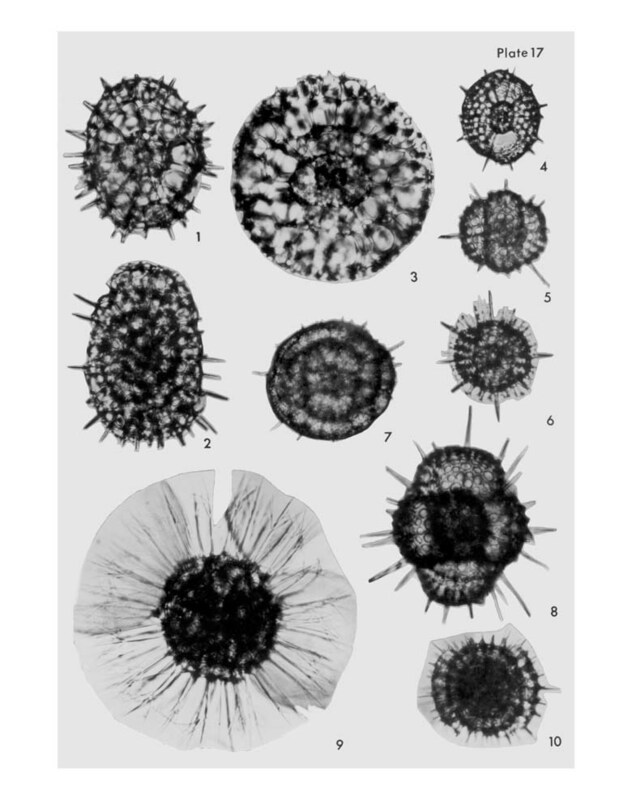 4-7 Amphitholus acanthometra Haeckel; 4, lateral view, VS-R-60b, 3-5cm, P15/4, 300x; 5, frontal view, VS-R-27b, 1-3cm, C38/4, 300x; 6, frontal view, outer mantle incomplete, VS-R-60b, 3-5cm, E34/2, 300x; 7, frontal view, outer mantle complete, VS-R-133b, 1-3cm, K36/2, 300x. 8 Cubotholus cf. octoceras Haeckel; frontal view, VS-R-81a, 1-3cm. Y48/2, 300x. 9-10 Lithelius minor Jörgensen; 9, VS-R-151b, 1-3cm, W36/4, 300x; 10, VS-R-71a, 1-3cm, L42/3, 300x.